In Palazzo Gran Guardia, in Verona, yesterday evening, was presented the Alé Cipollini Galassia 2017, women dream team, led by Alessia Piccolo, in the occasion of an elegant Gran Galà Alé. VERONA - An Official Presentation “at home” of the main sponsor to present to fans, friends and sponsor the athletes, staff, partners who believe and support the project, along with the ambitions and dreams for the next season, just around the corner. More than 700 people attended the event, that opened with Paolo Belli who sanf different “cycling” and funny songs. 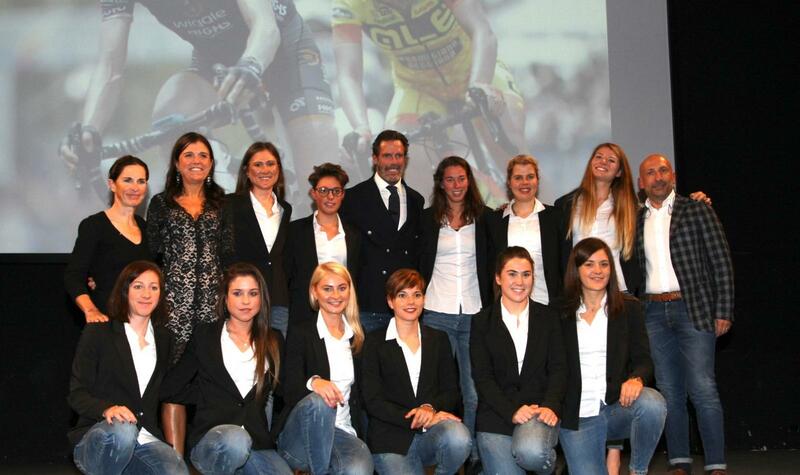 On the stage, followed by numerous interventions beginning two Champions of the past as Eddy Merckx and Mario Cipollini, the latter representing the eponymous brand, on which #yellowfluorange girls ride. There were talso he local authorities: the Mayor of Verona Flavio Tosi, with Alderman for Sport Alessandro Bozza and the Provincial President of the FCI Verona, Gianluca Liber. Alessia Piccolo, Alé Cipollini Galassia President, told about her project: “The team in 2017 grows and consolidates itself.. We have strengthened the team by placing experienced and successful athletes from all over the world. I strongly believe in women’s cycling, for this I have always personally involved in construction of a multi-year project “. To support this project, born in 2012, the pool of sponsors made in Verona, MCipollini and DMT that have brought success to the women’s sector, along with new sponsors such as Parmigiano Reggiano, which in 2016 chose to marry the draft of Alessia Piccolo. “For this we will ensure that our girls know how to give the best possible image to the brands they represent with performances and results that we know we can achieve” - ​​said Fortunato Lacquaniti, Sporting Director of #yellowfluorange team, who at his side will still have Fabiana Luperini, for the 3rd season. On stage were up all the athletes who will defend the colors #yellowfluorange in 2017. The only absent, justified, Marta Bastianelli, who will join the team in a few weeks for the first official training camp. Marta Bastianelli, Martina Alzini, Ane Santesteban and Anna Trevisi are the four confirmed athletes. With them, in 2017 will be in a group with #yellowfluorange colors even the strong Australian sprinter Chloe Hosking and fellow climber Carlee Taylor, with the Belgian Anisha Vekemans, the Dutch Janneke Ensing and strong German Romy Kasper. Even the Lithuanian Daiva Tuslaite and italian Soraya Paladin with Martina Stefani chose Alé Cipollini Galassia. Continuity, innovation and internationality, combined with its winning spirit: these are the key words of the project signed by Alessia Piccolo, for 2017. A great event that has opened in the best way the season of Alé Cipollini Galassia which will make its debut in Australia, on the streets of Santos Women’s Tour, scheduled from14th to 18th January.